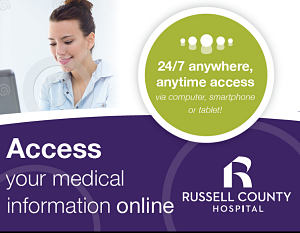 RCH MyHealth Portal is your online resource to access your personal health information. To view a list of Frequently Asked Questions, please click here. RCH MyHealth is available to all adult patients of the hospital since 2016 and clinics seen after July 1, 2016. If you have an email on file you can self-enroll and have access immediately. If you do not have an email on file self-enroll and once we verify your information we will send out an email with a link to create your login. Use the link below to complete the enrollment process. 1. How long does it take for my information to be released to RCH MyHealth? 2. What is the oldest date of service that I can view on RCH MyHealth? For the Hospital lab results will date back from 2004, but other visits will only be in the portal since 2013. 3. Can my children have an account on RCH MyHealth? Yes, if you are the legal guardian you may have access to your child's medical record. If the child is 12 or older, your child must complete a proxy form for you to have access. Proxy forms must be brought to Russell County Hospital or Family Practice Assoc of Russell County and all legal documents will be verified. If your child is 12 or older they must be present to verify their approval of the proxy. If you already filled out a Proxy form for FollowMyHealth portal email RCHPortalSupport@russellcohospital.org and we will verify and send a login link to the email on file. For all Proxy login links, please allow 5-10 business days for a response. 4. Who can access my information on RCH MyHealth? You control the access to your information. If you would like your spouse, next of kin, etc. to have access to your medical records then you will need to come to the Medical Records department, with a photo ID, at either Russell County Hospital or Family Practice Associates of Russell County to fill out a Proxy Request Form. 5. Can my spouse and I use the same email address to enroll in RCH MyHealth? Yes, however, if you use the same email address your spouse will know when there is a change to any medical information, due to notifications sent to the email address of file. 6. What do I do if there is a discrepancy in my record? To update personal information you can edit your profile (please allow 5-10 working days for changes to take effect). If there is a discrepancy in your medical records click here to submit your information securely. To provide quality compassionate healthcare consistent with the trust and support of the communities we serve.